There are very few spectators lining the bank on the outside of Turn 4 this Friday, which is sad because it’s a long corner with plenty of scope for improvisation. Gone, too, is the big grandstand between Turn 4 and Turn 9, replaced, inevitably, by a string of impossibly-expensive “merchandise” shops, a roast chicken stall that never seems to open and a bouncy castle (additional fee required). 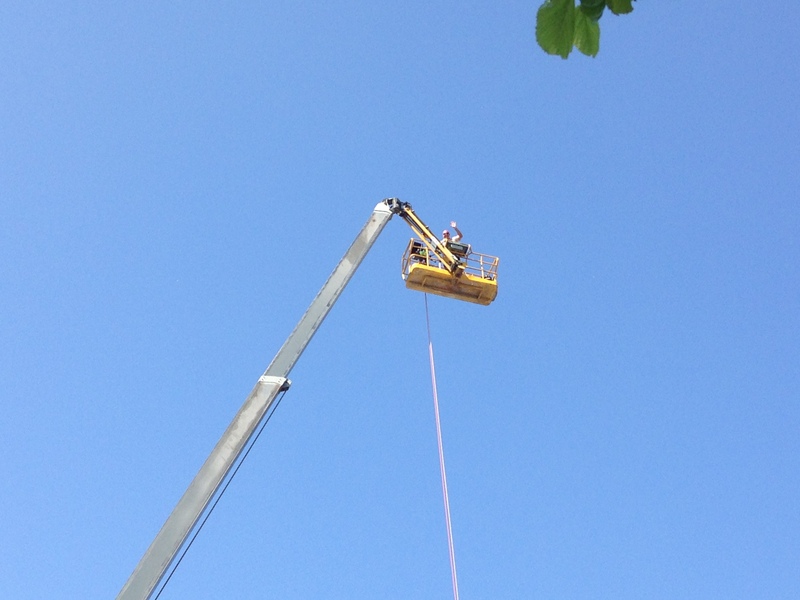 Jimbo Foley, ace cameraman, is shuffling his feet beside his huge hyrdraulic hoist. “It won’t work,” he says, shading his eyes against the early-morning sun. “No idea why. I’ll just have to wait,” he adds with a sparkle. Pastor Maldonado is one of the first to run hard through Turn 4. The black and gold car zeroes into an early apex – “extends the straight,” in Rob Wilson-parlance – then hugs the inside as the driver trades brake pedal for steering rotation. I can’t see this dance from up on the bank – but I can see the result. As the corner begins to open out, the E22 is nicely middle-of-track. Pastor is able to accelerate hard, almost in a straight line, short-shifting quickly from third to fourth, avoiding the dust and marbles on the outside. The car looks taut and driveable – and Pastor is quickly into repetitions: it’s reliable, too. Romain Grosjean, by contrast, turns in later and asks much more of the left-front. Two laps out of four he’s balancing slight understeer against throttle. He’s on the power sooner mid-corner but as he accelerates – without short-shifting – the back jumps out as he touches the marbles. Sebastian Vettel seems fast and neat – Mr Vee – but then suddenly loses power. He waves to us from a monkey bike as he rides back to the pits and even the Alonso fans return the gesture. His RB10 – a new chassis for this race – has shorted out. The entire loom needs to be replaced; and, although RBR have a full four hours in which to change it and to have the World Champion back out for the final 30 minutes of FP2, there is no hope. To save weight, today’s looms are one-piece; and their installation is the first part of any car build. To replace them, the entire car has to be dismantled. Add the complications of a 2014 F1 car and you have Sebastian Vettel spectating for the rest of the day – which is crazy, I think, in these days of F1 being a show and drivers like Vettel being the stars. That loom would have been replaced in far less time on a 2013 RB9. Lewis and Nico look very similar, although Lewis’s joins are slightly softer: both enter T4 right-of–centre; both have grip enough to rotate the Merc with astonishingly little loss of mid-corner speed. Both are patient for a half-second or so – and then both accelerate in straight-line bursts through the gears. The display of sheer power is breathtaking. Those joins – the most noticeable ones – are on the entry phase. You can see the moment Nico decides to turn the wheel; with Lewis, it is all-of-a-piece. The silver car leans into the corner. Daniel Ricciardo is no less stellar. He is Nico at least and sometimes Lewis. And the RB10 has enough grip to give Daniel a decent exit even when he enters a tad too quickly. At T4, this Friday, it is impossible to see where the Mercs are quicker, other than that the Renault is slightly shorter-geared and asks Daniel either to short-shift or hold a gear (fourth or fifth) for a fraction longer than perhaps he would want. The Mercs are quicker, of course, so that to me adds up to still-superior power in the driveability department. Ferrari. Red-bedecked Spaniards wave valiantly. And Fernando only once looks bad at T4. That is when he enters about 5mph too quickly, runs to the outside, tyres chirping, and then comes right out of the throttle to bring the thing back. Otherwise, he is a model of security and efficiency. There is nothing spectacular about Fernando here; there is, though, everything you need from a Ferrari driver extracting the repeatable most from his car. He vees the corner for lap after lap, extending the straight down the inside, running as if on rails to the outside, mid-corner, rotating the car with a boatload of patience and then accelerating out almost in a dead straight line. Two-thirds of the way through T4, Fernando is to the right of centre. Every other driver (with the possible exception of Sebastian Vettel, of whom we didn’t see enough) are either centre of the road (Maldonado, Massa, Perez, Hulkenberg, Ricciardo) or way out there, left of centre, accelerating hard through the gears still with massive lateral load pushing sideways through the rear tyres. Is this the quickest way through T4? This is certainly the way Fernando has always driven it; it was the way he drove it when he shadowed Maldonado into second place in the 2012 Spanish GP. I think for the Ferrari as it is at present – developing less grip than the Mercs and Red Bulls and certainly with less of a front end – it is the way to maximise traction and reward the car’s stronger points. Whether it’s quicker is a question that may be answered over the rest of the weekend, when Sebastian Vettel takes on Daniel Ricciardo. Kimi Raikkonen obviously doesn’t think so. He and Kevin Magnussen turned-in the earliest to T4 today and for most of the two sessions Kimi was looking for the harmony that would allow him then to rotate the car without having to float it out into Alonso territory. Time and again he was discordant, jabbing in the power in a series of ugly power-slides that said a million words, running too wide on exit, raising plumes of dust. Then, with about 20 minutes to run in the afternoon, with Jimbo now perched up high, Kimi suddenly finds the way to join the dots with the F14. Early entry – right-front brushing the kerb. Squat, perfectly-timed rotation. Flat exit, without a hint of oversteer. Klassic Kimi. He said afterwards that the car finally is beginning to give him some front-end feel. We’ll see tomorrow and on Sunday if this is a thing that will stick. Both Sahara Force India drivers appeared excellent through T4, with Perez looking slightly the neater and more consistent of the two, as in Bahrain. The lap times didn’t bear this out but to my eye it was clear: Perez is again driving within another of his relatively elusive sweet spots, looking like a driver who will qualify well (against his current run of form). Both extended the straight significantly into their braking areas; and both spent the right sort of time rotating the car for the cleanest of exits. SFI’s long gearing then made them look very good under hard acceleration. Felipe Massa, I thought, drove beautifully this day – an easy match for Hulkenberg and Perez. Twice he came into T4 too quickly – and on exits, of course, he was having to short-shift in order not to overload the rears with the short gearing. 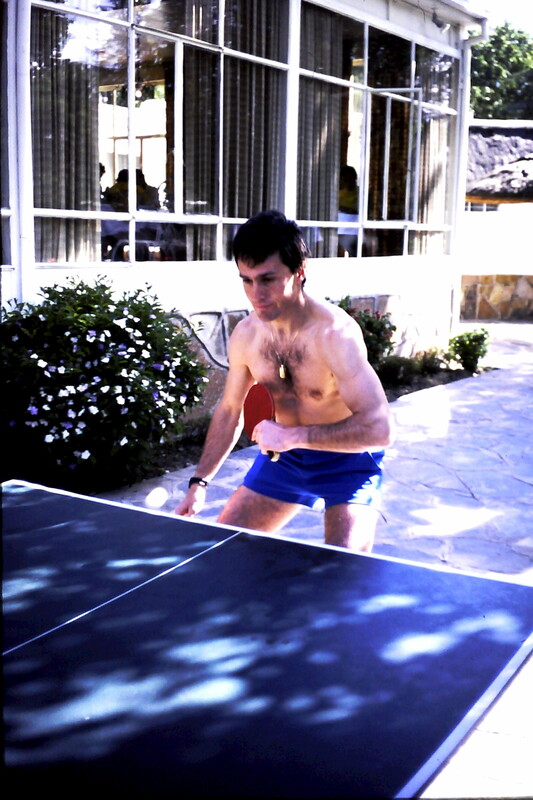 Even so, this was vintage Felipe. There was nothing edgy about his driving, nothing (apart from those two lock-ups) remotely dramatic. Valtteri Bottas lost the morning to Felipe Nasr – and that may or may not have been the reason he always came by looking like a more ragged version of Felipe. He didn’t do a lot of laps – he was delayed by a problem with that Williams gearbox – so for now we should give him the benefit of the doubt. A quick round-up of the others: Kamui Kobayashi looked very good (Hulkenberg-good) into T4 but couldn’t resist mid-corner power applications that were about half-a-second too early on any given lap. The crowd loved him; the opposite lock and the dust became his trademark; but sadly I don’t think this will translate into “long run” consistency. Marcus Ericsson to my ear always seemed to select a gear too low, just before rotation. Probably this was a security thing; certainly it affected his momentum. Adrian Sutil looked very, very good, I thought – if slightly less consistent than, say, Felipe Massa. Certainly this was the Adrian of which we used to see a lot – neat and early into an apex combined with a “shortening of the corner” via an efficient rotation, steering load against brake pedal. His occasional moments on exit I think we can put down to the Sauber’s punchy Ferrari gearbox (which runs the same casing as the works team but slightly different electronics). Esteban Gutierrez also lost his morning (to Giedo van der Garde) and seemed obviously to be in a rear brake problem, given the moments he was enduring into T4. Even so, he also looked very sharp mid-corner. Max Chilton turned-in earlier than Jules Bianchi but both were playing the Kevin Magnussen game by the time their entries were over. The despair in his eyes is more than I want to see. F1 is struggling for ratings, for sponsors…and now this. I leave quickly for my rental car. I want the day at T4 to remain unsullied. Solitude. The name is enough to suggest that this was more than just another circuit – and indeed it was. 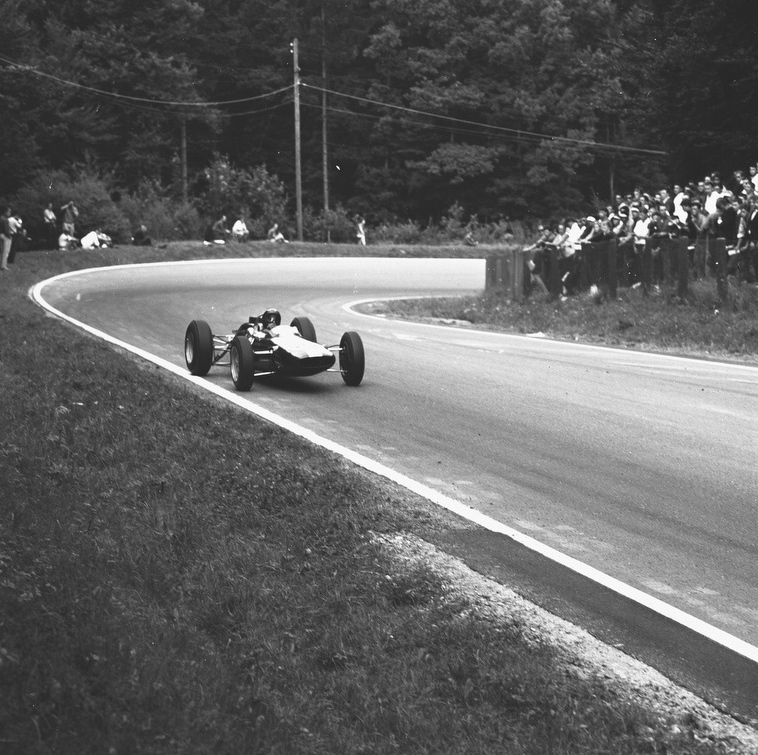 The Solitude Grand Prix, held on a sweeping, undulating and therefore very demanding road course under the shadow of the Schlosse Solitude, near Stuttgart, Germany, was in reality the Grand Prix of the German Motor Industry. Massive crowds flocked to the circuit when it opened pre-war – and continued to do so in the 1950s and 1960s, when over 350,000 people attended the July F1 races. 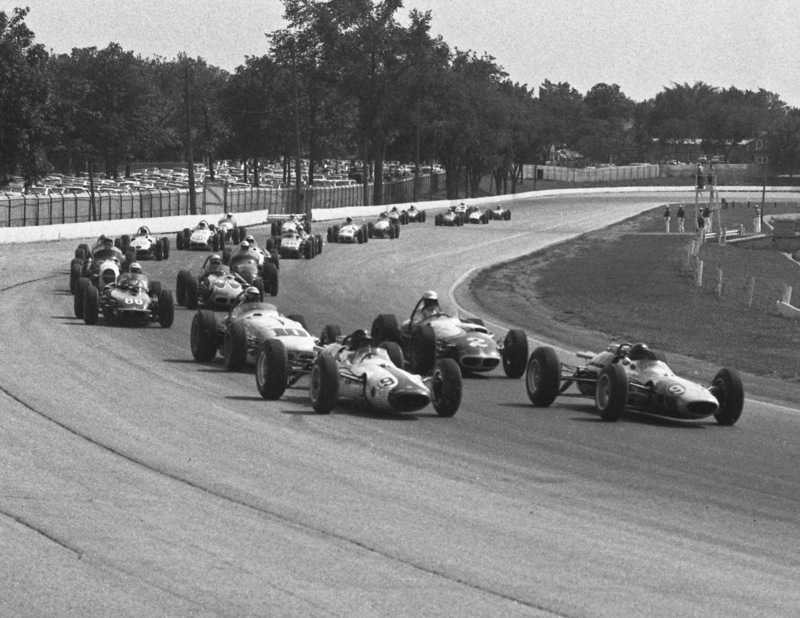 It was bigger than the Nurburgring; only Indianapolis, on a global scale, attracted a larger race crowd than Solitude. Mercedes did their share of winning, as did Porsche. Bosch was based at Stuttgart, too. Motor-cycle races were a huge success at Solitude; and the post-war F1 non-chamionship Grands Prix, and also Formula 2 races, held at a time when Porsche were on the ascendant, were no less spectacular. 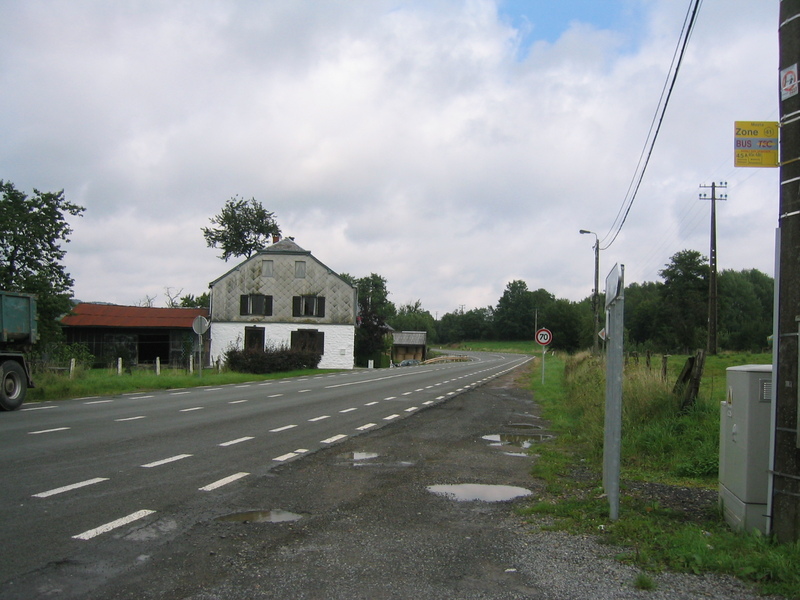 The drivers and key team people stayed at the nearby Eis hotel; it still exists today. 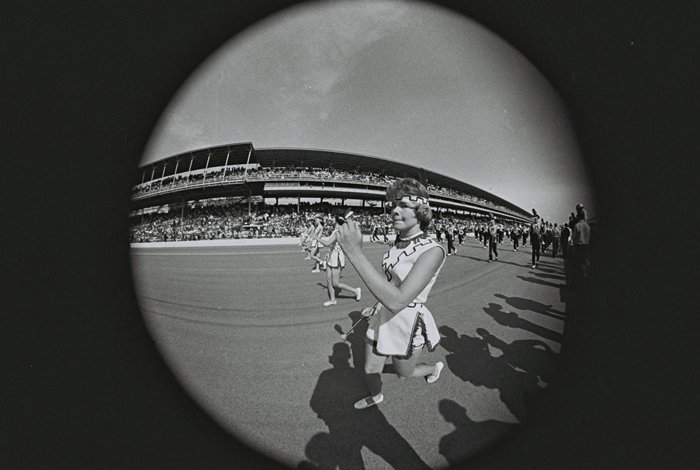 Legend has it that Innes Ireland once shot a loaded pistol there at a post-race party. It’s probably true, because Innes in later years became quite irritated when anyone mentioned it. 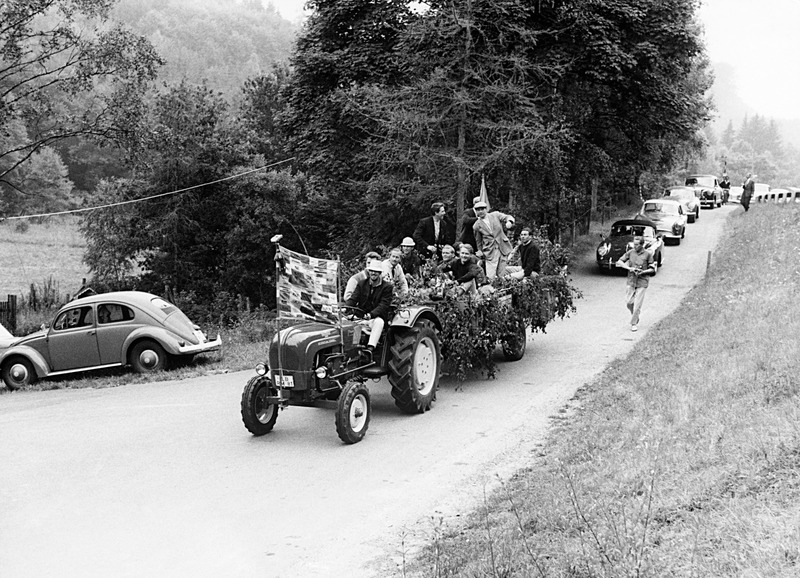 Baron Fritz Huschke von Hanstein, the wonderful Porsche Team Manager, was the early 1960s Solitude Grand Prix in much the same way that Geoff Sykes would be Warwick Farm, or Mrs Topham ruled Aintree. It was Huschke’s home race. He hosted parties at both the Porsche factory and at his residence – often for 400 people at a time, including royalty. He was everybody’s friend back then – and he was a friend to me, too, in the very early 1970s, when I was starting my F1 journalistic life. I met Huschke through the indefatigable Bernard Cahier, who described Huschke thus in his magnificent two-volume autobiography (entitled, appropriately, F-Stops, Pit Stops, Laugher & Tears): “Huschke had been a very talented driver before the war and as a result of his racing successes he’d become an honorary officer in the SS. This was all well and good before the war but when conflict broke out his status became official. Huschke wanted nothing to do with the war or the SS and for a time took refuge in Budapest, where he hobnobbed in high society while living with a beautiful Hungarian countess who was part-Jewish. He was eventually caught and sent to prison in Spandau, where he found himself in real trouble. Luckily, he had connections everwhere. It didn’t take long for him to pull some strings and get himself released. He contacted one of his old girl-friends whose father held an influential position in the German army, who in turn told the authorities that Huschke was going to marry his daughter! He was very lucky because, a short time later, the plot to kill Hitler was uncovered and there were wholesale executions in which Huschke might very well have been swept up. 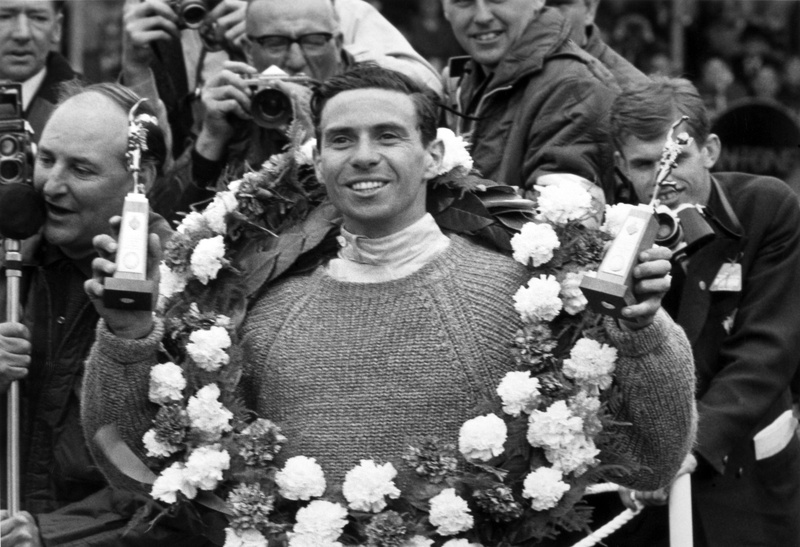 Dan won the Solitude Grand Prix that year, heading a Porsche one-two, and would never forget his victory lap, in an open Carrera, when thousands of caps and hats filled the air like leaves in an autumn wind; in 1963, though, with Porsche out of it, he didn’t race. 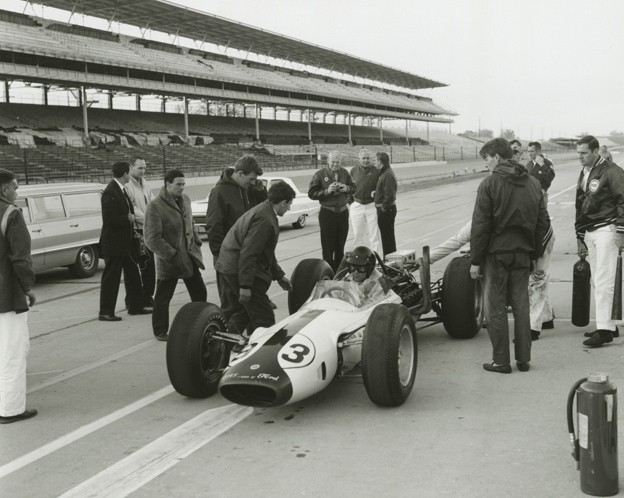 Instead, he flew straight back to Indianapolis after the British GP in order to drive Frank Arciero’s Lotus 19 at the Hoosier Grand Prix at Indianapolis Raceway Park. He won – and then flew to Germany for the next round of the Championship at the Nurburgring. Such were the schedules of F1’s front-runners in 1963. 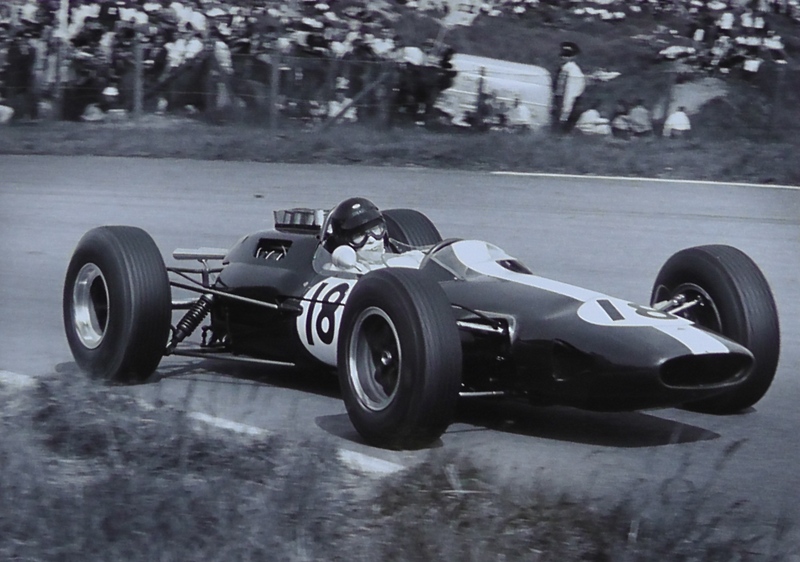 Brabham were thus represented in the 1963 Solitude Grand Prix only by Black Jack. 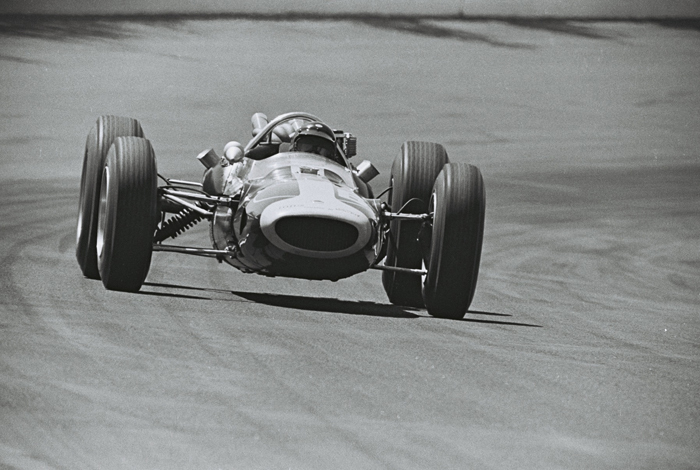 Team Lotus, by contrast, entered three cars, enticed no doubt by copious starting money. 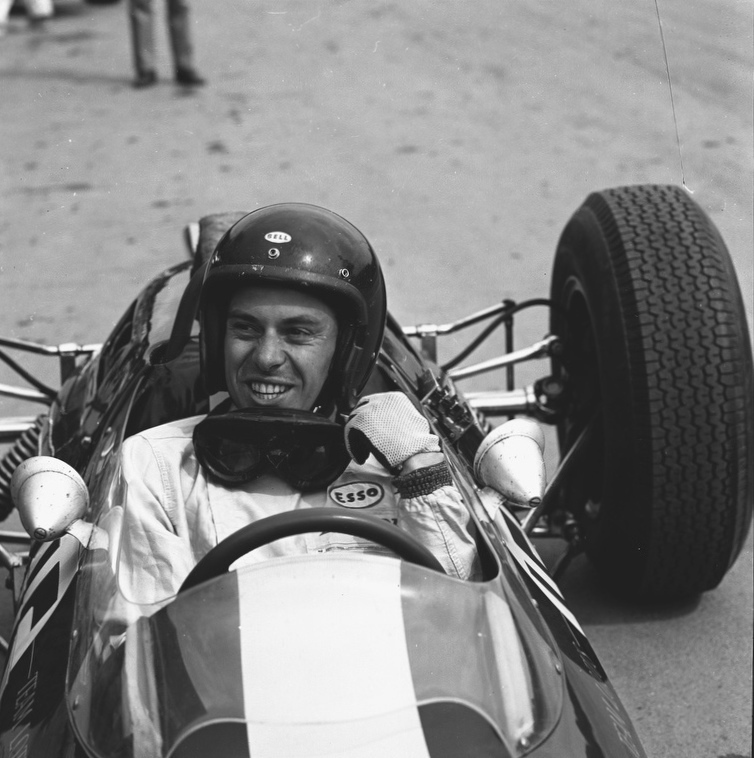 Jim Clark was in his regular Lotus 25 (prior to racing it the following weekend at the Nurburgring); Trevor Taylor drove the second car – and Peter Arundell, the FJ star, would finally be having his first race in a Lotus 25 (having briefly practiced at Reims.) A full grid of 29 cars started this 13th Solitude Grand Prix, with Jim on the pole from Jack Brabham and Jo Bonnier (a former Solitude winner, now driving Rob Walker’s ageing Cooper-Climax). The two other Lotus drivers filled the second row, Peter ahead. 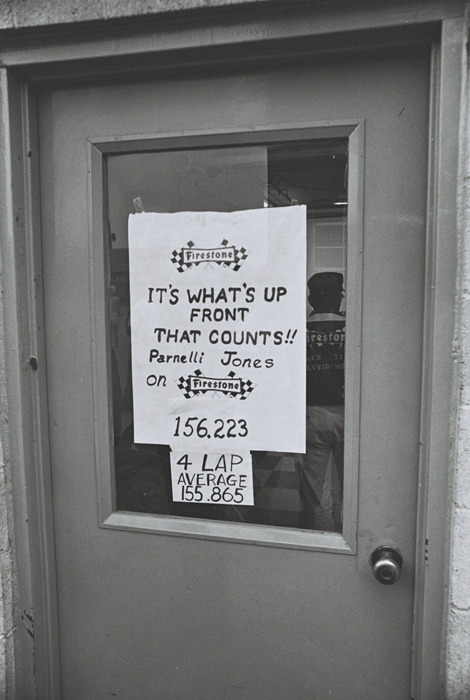 As it happened – as it frequently happens in Championship Years – Jim went nowhere in this race that didn’t count. Team Lotus tried a new drive-shaft design which promptly failed as Jim dropped the clutch at the start. His race prospects may have been over; still there were over 300,000 spectators at Solitude, crammed into the natural grandstands around the circuit, all hoping to see the maestro at work. Jim’s 25 was pushed back into the pits and re-fitted with the older-type drive-shafts. Jim waited patiently, helping the mechanics with pit signals to Trevor and Peter (who were running second and third behind Brabham). Then, donning his Les Leston gloves and lowering his goggles back around his peakless Bell, Jim climbed back into R4 for a few demonstration laps of high-speed precision motoring. Amazing all who saw it, Jim smashed the lap record with a time of 3min 49.1sec – a full 1.1sec faster than even he had managed in qualifying. Solitude was as dangerous as you could make it, with its exposed trees and walls; it was very fast, particularly on the 3.5-mile serpentine return stretch; and Jim was so far in arrears that he wasn’t even classified as a finisher. And yet he drove those laps at 100 per cent. Ten-tenths. Flat out. 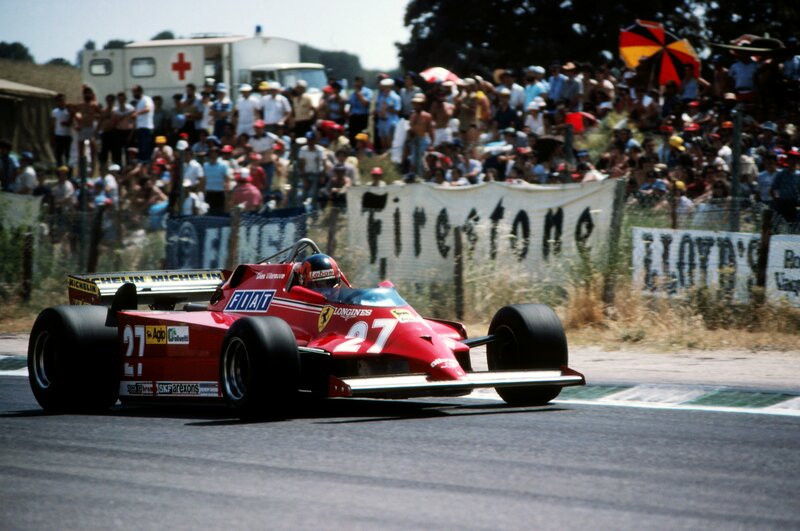 His fastest lap, when the tanks were at their lightest, was but one of 17 that were similarly on the limit. Black Jack, who had had nothing but mechanical problems from the start of the year, meanwhile breezed home without a worry to win his first F1 race at the wheel of a car bearing his own name. (Jack won the ’63 Australian Grand Prix in a similar car fitted with a 2.7 litre Climax engine). Peter Arundell drove beautifully to finish second ahead of Innes Ireland (and also to win the Formula Junior race that morning from Denny Hulme and Frank Gardner); Trevor retired with a broken crown-wheel-and-pinion; and Lorenzo Bandini, the young Italian pushing hard for a genuine chance at Ferrari, finished a spectacular fourth in the two-year-old Centro Sud BRM. I should also make mention of Chaparral founder, Jim Hall, who again drove well with his Lotus 24, qualifying on the fourth row and finishing sixth on Sunday. Jo Bonnier won the big-bore support GT race with his Porsche; and Teddy Pilette, son of Andre and future F5000 winner, headed the smaller GT race with his Abarth. From Solitude it was but a short autobahn blast to the Nurburgring, for the August 4 German GP. 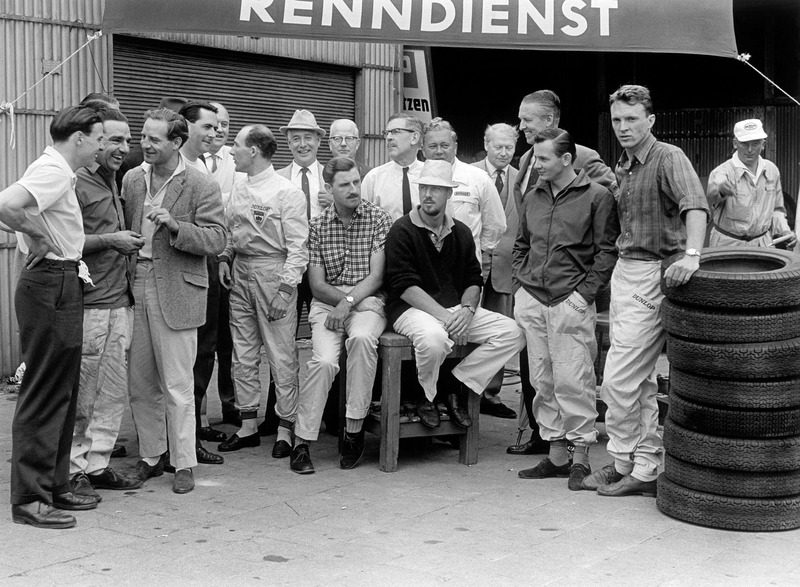 Jim had never won at the ‘Ring but had been phenomenally quick there in 1962 (in both the Lotus 25 and the little Lotus 23 sports car). An enjoyable, if frustrating, Solitude weekend now over, Jim’s thoughts turned to making it five World Championship Grand Prix wins in a row.